A 10 gallon fish tank is commonly chosen by those who are just beginning to sail across the vast ocean of fish keeping. Although this small sized tank is not large to keep many types of freshwater fish, it can accommodate several small fish and shrimps. The species that can live well in such a small tank are common small in size and easy to care for. Here are some nano fish you may like to keep in your tank. Community fish are fish that can live together peacefully in an aquarium. A 10-gallon community aquarium can hold up to 12 individuals, depending on the the kinds of fish. Using the rule “1 inch fish per gallon of water” to estimate how many fish you can keep in your 10 gallon tank. 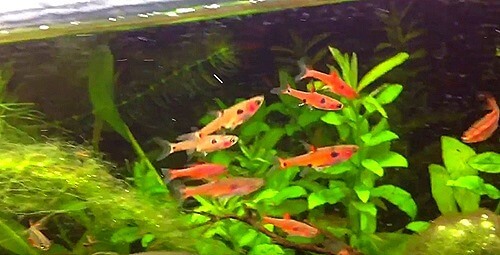 For example, you can stock 5 x mature Guppies (2-inches) in a 10 gallon tank. 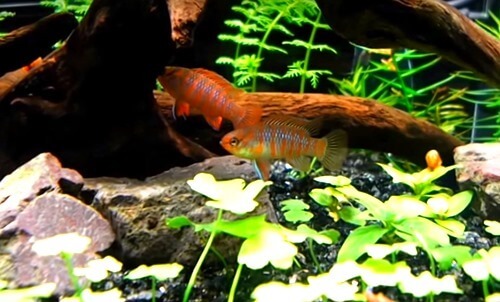 Provide this fish with a well planted tank with lots of decor to break up lines of sight and a few good hidey holes and you will be rewarded with a strikingly colorful and interesting fish. They enjoy heavy planting and, even better, they are naturally found with many commonly found and easy to keep aquarium plants such as Hygrophila, Rotala, Vallisneria and Limnophila. 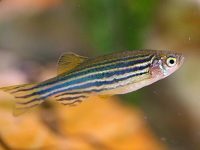 They can be fussy feeders and will prefer live foods; however, they will also feast on microscopic organisms found in suitably mature aquariums. Dario dario should not be housed with larger, dominating species as they are both slow moving and small. It is ill-advised to keep more than one sexed pair in a small tank as males can be territorial. 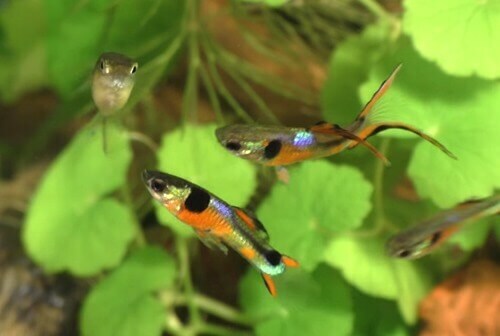 Guppies and their distant cousins, Endler’s Livebearer (Poecillia wingei) and Dwarf guppies (Heterandria formosa) can live in a small tank with 10 gallons of water. 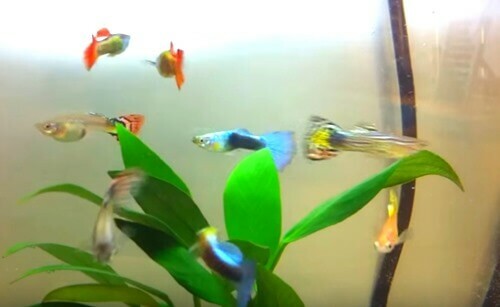 Endler guppies and Dwarf guppies are all livebearers and they multiply fast, but unlike guppies they do not eat their own fry. Besides, they don’t grow more than an inch and both are very colorful. Both breeds are ‘sociable’, as they can thrive with any other species of fish. 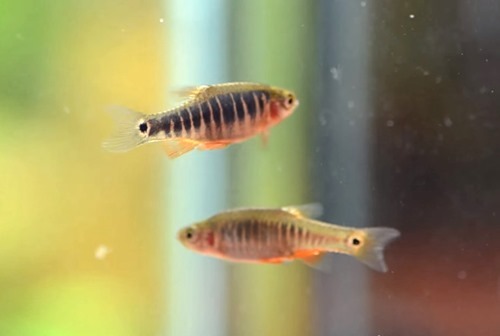 Dwarf Rasbora (Boraras maculatus), Emerald Dwarf Rasbora (Microrasbora erythromicron), and Mosquito Rasbora (Boraras brigittae) are entirely peaceful shoaling fish (meaning they often swim in small groups or ‘schools’). 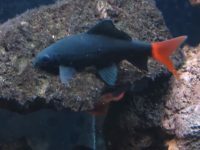 Rasboras are known for their prominently red gills and while the Dwarf has a huge black dot along its lateral line, the Emerald dwarf has several vertical stripes that run across its sides. These do on grow larger than 1.5” and can be kept in a small group with 6 specimens. 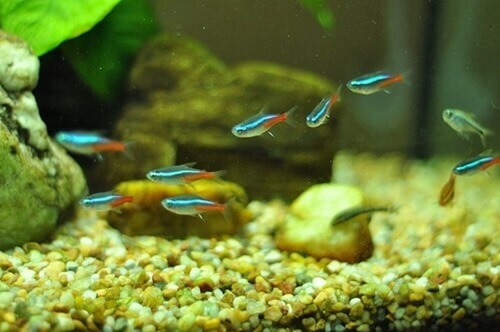 Neon Tetra is probably one of the most common aquarium fish that is loved by most hobbyists because of its attracting colors. With the small size they also put a very small load on your biological filter. Neon Tetras love a well planted tank with medium lighting and definitely need to be kept in a school of at least five or more specimens. With the right conditions they are brighter in color and more active. They love to swim around in the middle level of the tank and mix well with most other community fish that enjoy the same water conditions. 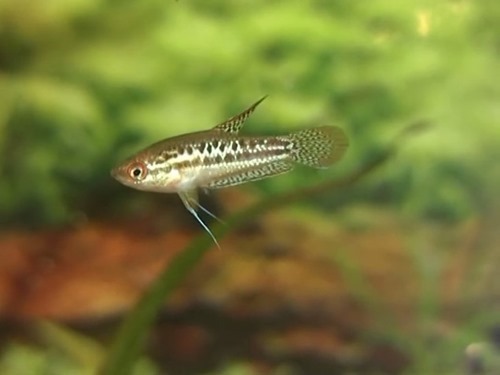 The Pygmy Corydoras is active, loves shoaling in close groups and stays small. A group of these could easily be kept in a 10 gallon aquarium with other small species or larger, peaceful fish that aren’t big enough to snack on the occasional Pygmy Cory for which they can make excellent dither species. They enjoy dense planting and natural decor that provides good cover, although they will tend to swim in the bottom of the water column. The addition of leaves and driftwood to their aquarium will help recreate more natural conditions; however, they would be fine without this providing there are no water quality issues. They prefer fine substrates owing to their sensitive barbels. They can be bred in the aquarium and are easily sexed. Fry may be hard to raise but it could be a good breeding project. 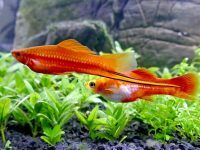 It is an ideal community tank fish. 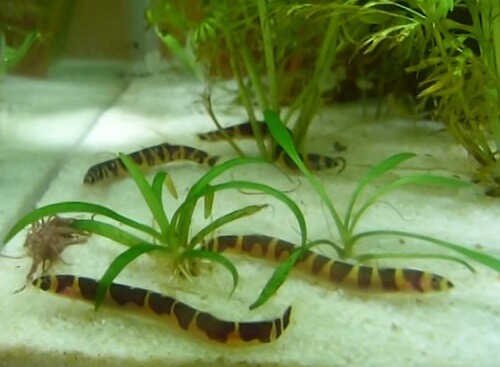 If the Kuhli loach is kept in small groups (three to six individuals), it will swim out in the open in and around piles of rocks and driftwood, looking for food, playing with its friends and generally performing its comical antics. Because they come from the sandy beds of mountain streams, or slow-flowing rivers, they should be housed in aquariums with a fine sand substrate. They prefer plenty of dense vegetation, such as Cryptocoryne species, as well as hiding places in the form of driftwood, overturned flowerpots, roots and rocks. Floating plants can be used to provide the subdued lighting they prefer. 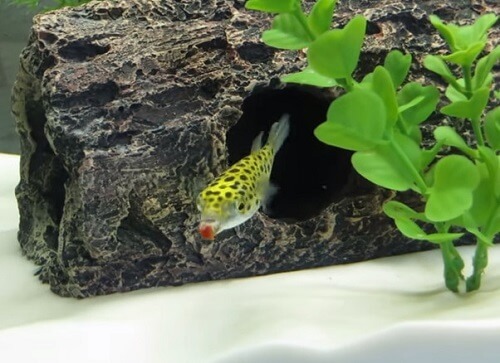 Kuhli loaches feed at night and will accept a wide variety of prepared flakes, freeze-dried foods and any small live foods that settle to the bottom. Supplement their diets with occasional servings of small worms, such as grindal worms, white worms or Tubifex worms. They are not commonly spawned in the home aquarium. However, when a pair does spawn it is usually near the surface of the water and is evidenced with the male wrapping himself around the female. Many greenish eggs are released and they may sink or float to the surface. If the parents are not removed, they will eat the eggs. 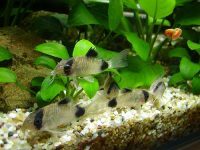 Two breeds of gourami, the Honey Gourami (Colisa chuna), and the Sparkling Gourami (Trichopsis pumila), are ideal for small tanks because these fish are very hardy and easy to care for. The smaller sizes than other Gouramis make them ideal choices for a 10 gallon fish tank. 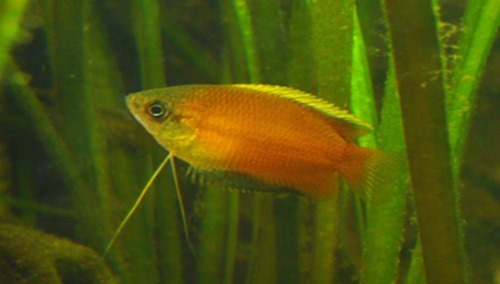 Honey Gourami are very good colorful additions to your community tank. Sparkling Gourami are not colorful as the Honey, but are quite pretty too. They may even ‘croak’ or ‘sing’ when breeding. It is best to include a trio of gourami with only one male, for male gourami are known to be aggressive. 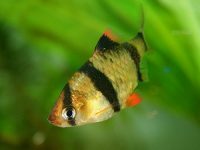 Species specific fish tanks are not meant to mix a species with other species as it may cause some dispute or these fish may require unique living conditions. Siamese Fighting Fish (Betta splendens), or Betta (male) are highly territorial and see others like them as rivals. So keeping two Betta males together in a tank – unless there’s a divider to separate them – is never a good idea. 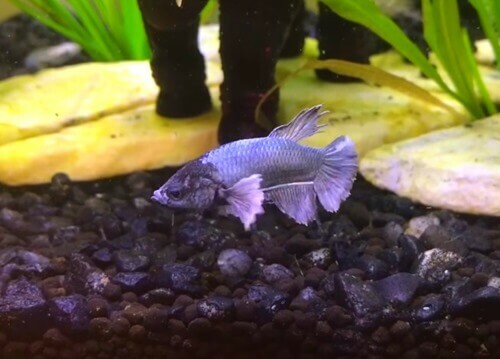 Male Bettas aren’t very tolerant of the female of the species either, except when it’s breeding time. A single male Betta is suitable to patrol around a 10 gallon fish tank, while small bottom dwellers swim below. 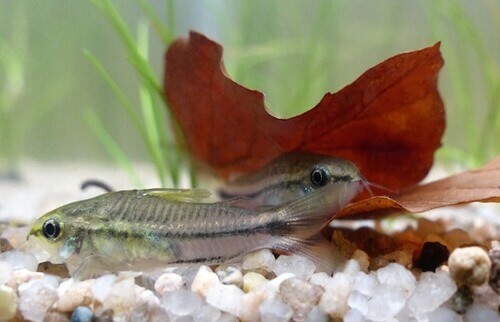 He can also thrive with 6 Pygmy Corydoras in a 10 gallon tank. Please note that Gouramis and Paradise fish are not suitable as Betta tank mates because they have some habits very similar to Bettas and are recognized as competitors to Bettas. Read more: Fish that can live together with a Betta. 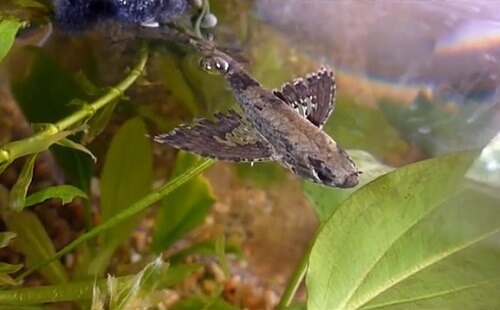 The African Butterfly Fish (Pantodon buchholzi) can’t cohabitate with any other species because this fish is known to be a carnivorous hunter. It has a remarkably large mouth that can swallow any other smaller fish. It also is a very good jumper, so a tight lid is necessary. Its very unusual appearance (a hybrid between a Lionfish and an elaborate Moth) makes it very interesting and vulnerable to nippy fish. It is best to be alone in the tank. These 1″ long fish must not be underestimated because these are known to be extra aggressive. Dwarf Puffers (Carinotetraodon travancoricus) are known to be able to kill fish bigger than them. A tank for 3 Dwarf Puffers should be well-planted, dense, and includes quite a lot of caves. Dwarf Puffers that often cross paths may cause disputes between each other. Instead of keeping fish, freshwater invertebrates are good alternatives. They are even more colorful than fish and only require low maintenance. Shrimps like Yellow shrimps (Neocaridina heteropoda var. yellow), Amano shrimps (Caridina multidentata), and Red Cherry shrimps (Neocardina heteropoda), are small species that are highly sociable and can thrive with other large fish (except Gourami. Gourami may see them as food!). 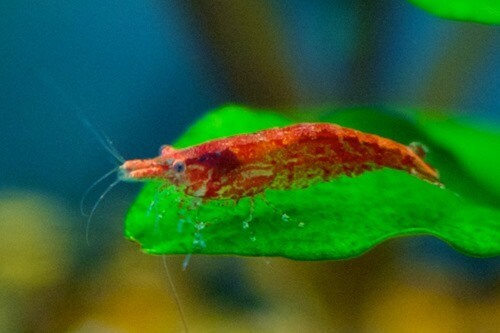 These shrimps have a more algae-based diet, so they won’t be out-competed for food. A 10 gallon tank can hold up to a hundred shrimps without any problems. Red Claw Crabs (Perisesarma bidens) are brackish water (a somewhat mixture of fresh and salt water) dwellers, and are better off alone. Joining one with other crabs may cause territorial disputes. 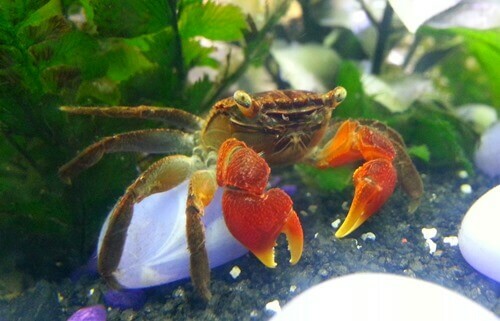 Fish could also be a food source for the Red Claw Crab. It also needs some area out of the water or it may die.